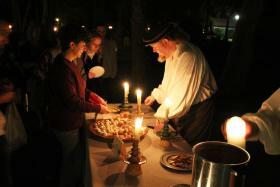 Christmas in Old St. Augustine featuring an evening in Spanish St. Augustine in the year 1580, when the Spanish settled south of the Plaza. Music by Cantorae St. Augustine, Harpist Mary Jane Ballou and Violinist Sue Cryan. Las Posadas and colonial-period drama. Samples of holidays treats and a Spanish belen (nativity scene) to view. All free and open to all on the grounds of the historical Mission in St. Augustine.